Donald Eugene Tillman, age 65, of Mt. Vernon, Missouri, passed away at 3:55 p.m. on Thursday, January 24, 2019, at the Mercy Hospital in Joplin, Missouri after a brave battle with Chordoma. He was born July 18, 1953, in Kansas City, Missouri, the son of William and Catherine Rose (Whalen) Tillman. Donald was a 1972 graduate of Mt. 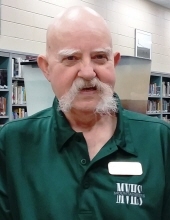 Vernon High School and was the lead custodian for the high school for 24 years. What made him love working at Mt. Vernon High School were the connections he made to the students. He touched many lives of students and was beloved by them. He founded the cookie club and allowed graduating seniors to sign the wall in his office. He was a member of the Mt. Vernon Lions Club and was a host family for 32 foreign exchange students over the years. On June 1, 1973, he married Loraine Carma Barrett. Donald is survived by his wife of 45 years, Loraine; one son, CW Tillman of Mt. Vernon; one granddaughter, Caitlin Wahe, of Albuquerque, New Mexico; three sisters, Cathy Gregory and her husband, Ed, of Lompoc, California, Jan Robertson and her husband, Richard, of Tecumseh, Missouri and Mary Beedle of Joplin, Missouri; one brother, Calvin Packer of Joplin and numerous nieces and nephews. His parents, William and Catherine, and brother, Michael Tillman, preceded him in death. A visitation will be held from 2:00-5:00 p.m. on Sunday, January 27, 2019, at the Mt. Vernon Church of Christ. A celebration of Donald’s life will be held at 4:00 p.m. on Saturday, February 2, 2019, at the Mt. Vernon High School. A private family burial will be held at the Mt. Vernon City Cemetery. Arrangements are under the direction of the Fossett-Mosher Funeral Home in Mt. Vernon. Memorial donations may be made payable to the Emergency Children’s Services or the Chordoma Foundation, in care of the funeral home. To plant a tree in memory of Donald Eugene Tillman, please visit our Tribute Store. Mt. Vernon City Cemetery, Mt. Vernon, MO. "Email Address" would like to share the life celebration of Donald Eugene Tillman. Click on the "link" to go to share a favorite memory or leave a condolence message for the family.